Topaz Energy and Marine, Bygg nr. 840 og 841 ved Vard Brattvaag, VARD 3 08 "Topaz Tiamat" & "Topaz Tangaroa"
Singapore, 27 September 2015 – Vard Holdings Limited (“VARD”), one of the major global designers and shipbuilders of offshore and specialized vessels, is pleased to announce that it has secured new contracts for the design and construction of two Offshore Subsea Construction Vessels (“OSCV”) for a new customer, Dubai-based Topaz Energy and Marine (“Topaz”). Specially developed for crane operations and light subsea construction with intervention duties, the vessels will be of VARD 3 08 design, measuring a total length of 98.1 meters with a beam of 20 meters. Designed by Vard Design in Ålesund, Norway, and with hulls to be constructed at Vard Tulcea in Romania, delivery is scheduled from Vard Brattvaag in Norway in 3Q 2017 and 4Q 2017 respectively. The aggregate value of the two contracts exceeds USD 100 million. The DP2 class vessels will have a 120-ton active heave compensated offshore crane with the capability to reach working depths of 3000 meters. Subsea equipment can be lowered down onto the seabed through a 7.2m x 7.2m moonpool or over the shipside. In addition, both vessels will be prepared for two Remote Operated Vehicles (ROVs), which are deployed via Launch and Recovery Systems (LARS) in the ship’s side. The vessels will be built according to the latest Special Purpose Ship (SPS) regulations, and can accommodate up to 82 persons in high standard cabins. CEO and Executive Director Roy Reite commented, “We are honored to receive these contracts from our new customer in Dubai, and are pleased to welcome the company into VARD’s client portfolio. We look forward to developing these new vessels closely with the Topaz team." - UT 745 "Topaz Commander", ex. "Ocean Lady"/"Ocean Commander"
- UT 745 E "Topaz Captain",ex. "Normand Rover"/"Rover"/"Boa Rover"
Både bygg nr. 840 "Topaz Tiamat" og bygg nr. 841 "Topaz Tangaroa" har vert på prøveturer, så dei er vel snart klare til overlevering? Noken som har informasjon om kontrakter på desse to? Skal dei flaggast om frå NOR? Reach Subsea and MMT have over the last year been awarded several important frame agreements for Survey, IMR and light construction within both the oil & gas and renewable sector. With this backdrop of expected increase in activity, Reach Subsea has entered into an agreement with Topaz Energy and Marine (Topaz) for use of the newbuild subsea vessel Topaz Tiamat for 2.5 years, with three yearly options thereafter. Topaz Tiamat will be deployed into the successful co-operation agreement Reach has with MMT. The commercial terms of the charter agreement are confidential between the parties, but are structured in a way that enables Reach and MMT to offer a competitive subsea service to our clients for the next 5.5 year period. 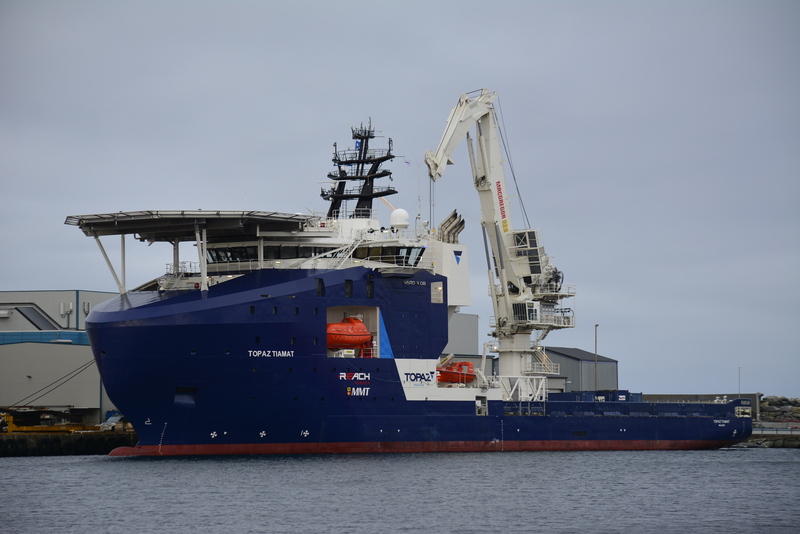 The Topaz Tiamat is a 1,000m², diesel-electric light subsea construction vessel with 82 pax accommodation in comfort class 3, equipped with an AHC 120-tonne subsea construction crane. The vessel is built to the highest North Sea standards, with world-class station keeping and fuel economics. The charter envisages a battery pack upgrade that will even further drive fuel savings and reduce the vessels environmental footprint. The Topaz Tiamat will be mobilized during Q1 2019 with ROVs from within the current Reach ROV fleet. Thus, investments associated with this expansionary move are limited at the outset. The vessel is intended used for Reach and MMT own projects within Survey, IMR and light construction within the oil & gas and renewables sectors. This subsea spread is well suited for our core focus markets and has a good fit with the tenders we currently have outstanding. Jostein Alendal, CEO of Reach says: "We are very pleased to be able to offer a next generation subsea spread to our clients, an energy efficient vessel that fits nicely into our focus markets. The Topaz Tiamat is the first vessel chartered from Topaz, but based on their professionalism and proactive approach, we believe this will be the start of a successful and productive cooperation going forward." Rene Kofod-Olsen, CEO of Topaz Energy and Marine said: The Tiamat and Tangaroa, designed with, and built by, VARD Norway, set new benchmarks in efficiency, operability and cost-competitiveness. These vessels, along with Topazs agile commercial mindset and reliability as a counterparty, have allowed us to forge a new long-term partnership with a strong subsea partner like Reach Subsea and we look forward to continue finding innovative ways of serving the offshore energy industry together. Dubai, UAE, 20 December 2018: Topaz Energy and Marine (“Topaz”), a leading offshore marine logistics company, has signed a substantial agreement with a large north European contractor. The contractor will charter Topaz’s newbuild subsea vessel, Topaz Tangaroa, for work on renewable energy projects, primarily in support of offshore wind farms in the southern North Sea. The contract underlines the growing significance of offshore wind projects to Topaz. 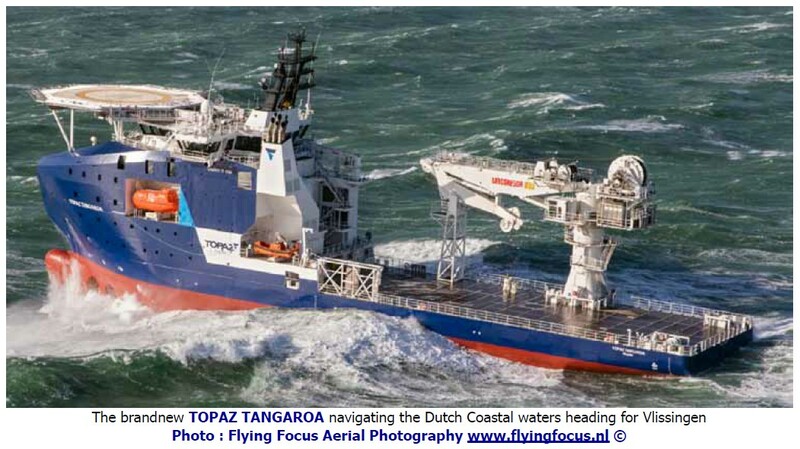 The Topaz Tangaroa, which was ordered in 2015 as part of an ongoing fleet renewal and reinvestment strategy by Topaz, is a 1,000m², diesel-electric light subsea construction vessel with 82 pax accommodation in comfort class 3, equipped with an AHC 120-tonne subsea construction crane. The vessel is built to the highest North Sea standards, with world-class station keeping and fuel economics.The Topaz Tangaroa and its sister vessel, the Topaz Tiamat, were both designed with, and built by, VARD Norway. The charter adds to Topaz’s industry-leading revenue backlog, which as of 30 September 2018 stood at US$1.4 billion. 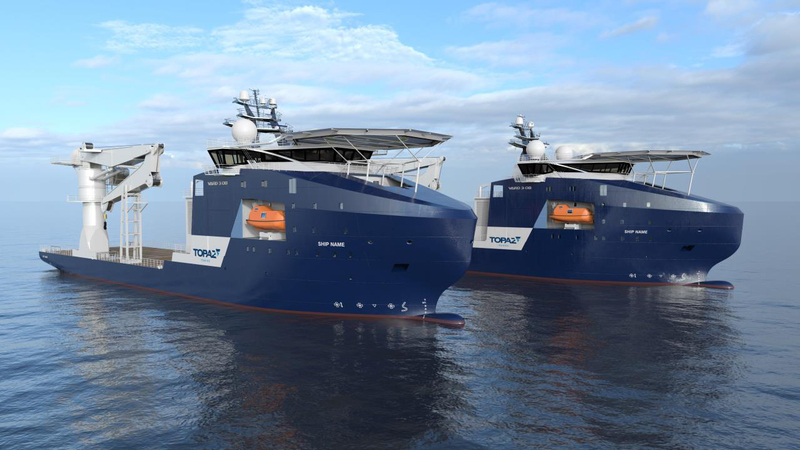 “Having recently signed the Topaz Tangaroa’s sister vessel – the Topaz Tiamat – on a long-term contract to Reach Subsea of Norway, it is particularly rewarding that both vessels are leaving the yard to go straight onto significant contracts with strong counterparties. The contracts reflect the trends we are seeing with both general subsea operators and offshore wind project owners becoming increasingly selective and demanding innovative, safer and more efficient vessels. "Topaz Tiamat" ved Killingøy i Haugesund.